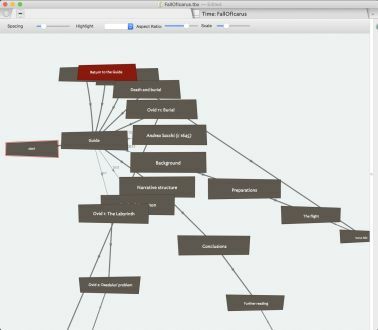 Eastgate Systems has released Tinderbox 8.0, a major upgrade to its note-taking assistant and information manager that gains new features to help you visualize and analyze your data. The updated app adds a new Hyperbolic View that provides an interactive and animated portrait of notes currently in focus. The new Filtered Outline view lets you focus exclusively on notes of interest while hiding details you don’t need at the moment. Finally, maps and outlines boast improved responsiveness, color options, and typography. I have been looking for a program to help me organize a photoblog. I need it to handle photos, audio and then text when I transcribe the audio (trying to use Loopback for that part). Would this program be overkill? Considering Devonthink as well. Any others that would fit in that category? Having iOS link would be a plus, which is where Devon may be better. @raykloss, you might also take a look at Reinvented Software’s Keep It (formerly Together — but it’s improved a lot since those days). Works on iOS and macOS with iCloud synchronization. For my use, I need (Markdown) text and PDFs, but also the occasional photo, audio, and video file. I’m still running the trial versions, but I’ve spent literally decades bouncing around among various options — including DEVONthink Pro Office — and I’m pretty sure I’ve never been as optimistic about a potential solution. I wrote to the developer this weekend and heard back from him this morning with a helpful response; I find that a major plus. The developer behind Keep It is a great guy. Very responsive and the simple structure of Keep It, organized around actual folders in Finder is reassuring too. It’s a long time in development so stable and smooth in use. We’ve been fans since the early days when it was Keep It Together, then Together and now… Keep It. My wife still uses it, but I have outgrown it, but always had good experiences. DevonThink is a more full featured option, more of a research and archiving tool in many ways, it’s a tool to grow into over years. It is the at the centre of my company record keeping as well as the primary tool for my photography research. An extraordinary application in my experience, but quite a learning curve and the benefits of its ability to expand and organise only becomes clear over time. I am kind of fascinated by Tinderbox and have stood on the edge looking at it for quite some time, every now and then I download the demo and kick the tires a bit, but it seems like such a mountain to climb (and I have so many of them already…) I end up leaving it. But it’s an intriguing prospect nonetheless. Actually tried this out and looks like it may be a solution that is not too complicated. The program seems very well thought out with some room to grow. And, yes, it is nice that the underlying structure is Finder folders and not proprietary.